The United Nations General Assembly, in resolution A/RES/71/280 of 17 April 2017, requested, inter alia, “the regional commissions and their sub-regional offices, in collaboration with other relevant entities of the United Nations system, particularly IOM, to organize discussions among Member States and other relevant stakeholders to examine regional aspects of international migration and to provide inputs, in accordance with their respective mandates, to the preparatory process of the global compact”. The Asia-Pacific Regional Preparatory Meeting for the Global Compact for Safe, Orderly and Regular Migration will provide a forum to identify key migration issues, challenges and priorities for the Asia-Pacific region; to identify existing national, bilateral, subregional and regional arrangements in place to ensure safe, orderly and regular migration; and to arrive at a set of conclusions that can serve as a regional input into the global stocktaking meeting due to be held in Mexico in December 2017. In doing so, this will help to inform the negotiations on the Global Compact on Safe, Orderly and Regular Migration, to ensure that the final document addresses the situations faced by Governments of the Asia-Pacific region, and migrants from, to and between countries of the Asia-Pacific. The meeting will elect a chair and two vice-chairs. The provisional agenda will be considered and adopted by the Meeting, subject to such changes as may be necessary. The list of participants will be available online at www.unescap.org/events/asia-pacific-regional-preparatory-meeting-global-compact-safe-orderly-and-regular-migration. A panel of prominent speakers with knowledge of the process of developing the global compact for safe, orderly and regular migration will discuss the background to the current process from different perspectives including government, civil society and international organizations. The Meeting will review the progress made in the Asia-Pacific region in facilitating safe, orderly and regular migration in line with the New York Declaration for Refugees and Migrants and commitments in the 2030 Agenda for Sustainable Development. As a basis for its deliberations, the Meeting will have before it the note by the secretariat (E/ESCAP/GCM/PREP/1 and Corr.1) in which the key trends of international migration, including associated challenges, are outlined, as well as the note by the secretariat (E/ESCAP/GCM/PREP/2) in which key considerations with regard to international migration and the 2030 Agenda are highlighted. Meeting participants may wish to share experiences and findings with regard to adopting policies and programmes to facilitate safe, orderly and regular migration, including progress in implementing the New York Declaration and the migration-related commitments of the 2030 Agenda. The deliberations under this agenda item are expected to result in enhanced understanding of good practices, regional priorities and challenges associated with the implementation of the New York Declaration and the migration-related commitments of the 2030 Agenda. Issues covered will include the following: enhancing the development contributions of labour migration; developing legal channels for labour migration through national policies and bilateral, regional and international cooperation, including seasonal and circular migration programmes, to address skill and labour force shortages; ensuring legal, transparent and low-cost recruitment procedures; realizing decent work for migrants on the basis of international labour conventions in line with Sustainable Development Goal target 8.8; promoting respect for the rights of labour migrants in line with internationally agreed human rights conventions; promoting international cooperation for recognition of skills and qualifications; reducing remittance transfer costs in line with means of implementation c of Goal 10; and strengthening dialogue with social partners for policy development and implementation on labour migration. As a basis for its deliberation, the Meeting will have before it the note by the secretariat (E/ESCAP/GCM/PREP/3) which contains an outline of key trends of labour migration and challenges to ensuring that labour migration is safe, orderly and regular, as well as measures implemented by countries to address these challenges. Recommendations for consideration by the Meeting are also highlighted in the note. Issues covered will include the following: ensuring that migration is voluntary; addressing factors driving unsafe migration, including through support for sustainable development, peace-building interventions, promoting peaceful and inclusive societies based on international human rights and the rule of law, and climate change mitigation and adaptation in line with the Paris Agreement and the Sendai Framework for Disaster Risk Reduction 2015-2030; developing potential inputs to non-binding principles and voluntary guidelines, consistent with international law, to address the situation of migrants in vulnerable circumstances who do not qualify for international protection as refugees and who may need assistance; and facilitating forms of migration that support development in countries of origin, including through sustainable reintegration of migrants. As a basis for its deliberation, the Meeting will have before it the note by the secretariat outlining key trends and policy considerations with regard to the nexus between climate change and migration (E/ESCAP/GCM/PREP/5), as well as the note considering mixed forms of migration in the Asia-Pacific region (E/ESCAP/GCM/PREP/4). Recommendations for consideration by the Meeting are also highlighted in these notes. Issues covered will include the following: factors underlying smuggling of and trafficking in persons in the Asia-Pacific region; bilateral and subregional frameworks for the prevention of smuggling and trafficking, prosecution of perpetrators and protection of smuggled migrants and victims of trafficking; and challenges in identifying and providing appropriate forms of assistance to migrants and victims of trafficking. As a basis for its deliberation, the Meeting will have before it the conference room paper (E/ESCAP/GCM/PREP/CRP.1) in which key trends in the smuggling of and trafficking in migrants, as well as the measures implemented by States to address these trends, are outlined. Recommendations for consideration by the Meeting are also highlighted therein. Issues covered will include the following: building on existing bilateral and subregional frameworks and processes to maximize their potential to facilitate safe, orderly and regular migration; promoting cooperation between States of origin, transit and destination to promote the protection of migrants and maximize the development benefits of migration throughout the migration cycle, including during return and reintegration; exploring measures to ensure the portability of social protection; and identifying means to address migration crises in a balanced, comprehensive and coordinated fashion and in accordance with commitments under international law. As a basis for its deliberation, the Meeting will have before it the notes by the secretariat (E/ESCAP/GCM/PREP/3, E/ESCAP/GCM/PREP/4, E/ESCAP/GCM/PREP/5) and the conference room paper (E/ESCAP/GCM/PREP/CRP.1), in which key trends in migration in the region and regional cooperation initiatives to address those trends are outlined. Recommendations for consideration by the Meeting are also highlighted in the notes. The Meeting will review the draft Chair’s summary, which will serve as the regional input for the global stocktaking meeting in Mexico in December 2017. It will reflect the diverse positions of the States of the region to ensure that Asian and Pacific views are reflected effectively at a global level. The Meeting will be invited to consider and adopt the report, including the Chair’s summary. Closing statements will be delivered. H.E. Mr. Juan Jose Gomez Camacho Ambassador Extraordinary and Plenipotentiary Permanent Mission of Mexico to the United Nations, New York, U.S.A.
Mr. Fernando de la Mora, Second Secretary, Permanent Mission of Mexico to the United Nations, New York, U.S.A.
Mr. William Lacy Swing, Director General, Geneva, Switzerland. Ms. Wen Li, Senior Regional Advisor for Asia and the Pacific, Headquarters, Geneva, Switzerland. Mr. David Martineau, Migration Policy Officer, Multilateral Partnership Division, International Cooperation and Partnership Department, Geneva, Switzerland. Ms. Mailan Minh Hanh Thai, Associate Migration Policy Officer, Geneva, Switzerland. Mr Rafendi Djamin, Founding Member, Melbourne, Australia. Ms. Suluck Lamubol, Programme Officer, Labour and Migration Programme, Chiang Mai, Thailand. Item 2: Review of migration policies and programmes and their impact on facilitating safe, orderly and regular migration and on supporting all dimensions of sustainable development. The Asia-Pacific Regional Preparatory Meeting for the Global Compact for Safe, Orderly, and Migration is scheduled to be held at the United Nations Conference Centre (UNCC), in Bangkok, from 6 to 8 November 2017. The opening of the session will take place at 0900 hours on 6th November 2017, in Conference Room 3, UNCC. All subsequent meetings will also be held from 0900 hours to 1200 hours and 1400 hours to 1700 hours. Participants are requested to register online at https://meetings.unescap.org/ well in advance, but no later than 15 September 2017, to facilitate smooth coordination of the issuance of photo badges and compilation of the list of participants. Participants are encouraged to submit their photo in advance, which will speed up the registration process. Furthermore, please kindly note that prior online registration is mandatory in line with standard United Nations security procedures to facilitate security clearance. Delegates are advised to consider the possibility of traffic blockage and heavy congestion around the UN Building on 6 November 2017. Participants are requested to bring with them copies of the meeting documents distributed by the ESCAP secretariat to their Governments/Agencies/ Organizations prior to the session. Only a limited number of copies of such documents will be available during the session. Documents for circulation or distribution at the session should be handed to Mr. Paul Tacon, Social Affairs Officer, (email: [email protected]), Social Development Division, ext. 1237. In accordance with the United Nations regulations for the control and limitation of documentation, the secretariat cannot undertake to process and/or reproduce documents or a statement submitted by individual delegations, unless the Commission specifically takes a decision to that effect and approves the financial implications thereof. 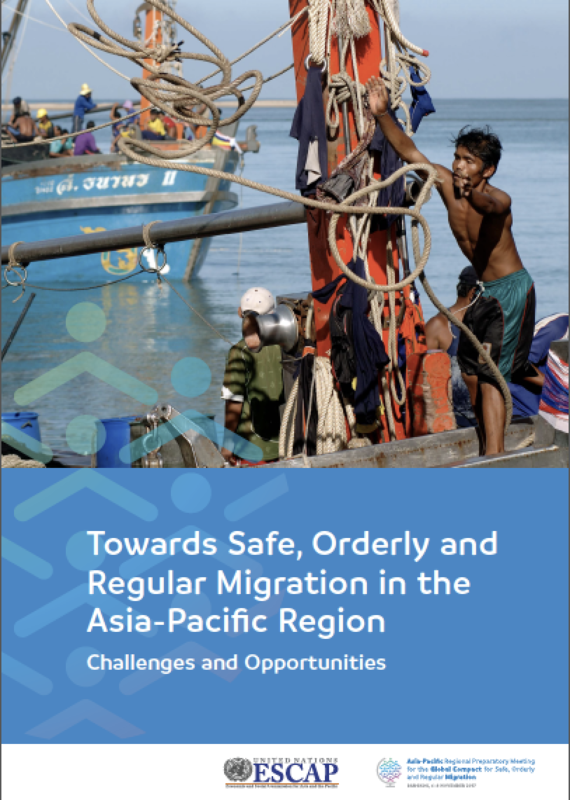 This Report supports the process of negotiating a Global Compact for Safe, Orderly and Regular Migration by providing an evidence base on migration in the region, including trends, key issues and recommendations, to feed into the Asia-Pacific Regional Preparatory Meeting for the Global Compact for Safe, Orderly, and Regular Migration. . This compact will be adopted in 2018 to help guide the world towards a future in which migration is voluntary, and the rights of migrants are respected for the benefit of all.